Listen to your body’s anger warning signs and control your temper . . . before it’s too late! by Max Nass, LMHC, and Marcia Nass, MS Ages 7-12. 2-4 players. Help kids tune in to the physical warning signs of anger. Some of us clench our fists; some tremble; others have the urge to throw something. All of us experience physical symptoms—warning signs—when anger is about to erupt. This clever card game introduces kids to these "anger alerts" and teaches 10 easy strategies they can use to calm down and retain their composure. As players race to get rid of their cards, they respond to anger-provoking situations. But before responding, they must invert an hourglass timer and wait 7 seconds. This delay reminds kids to stop and think before they act. 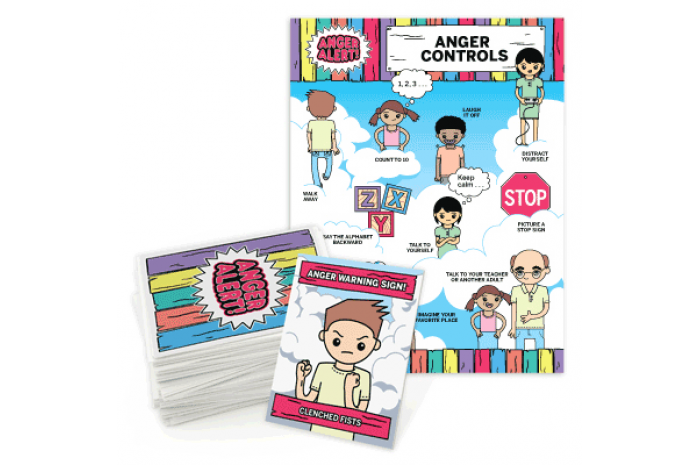 An eye-catching poster displaying both anger warning signs and anger control strategies is included, along with four colorful sand timers—which are always a big hit with kids.